This past September, I completed my first e-book. From idea to finished product, it took me approximately nine months to complete. And while you may think the writing aspect was the most difficult part of the process – it wasn’t. For me, the most challenging aspect of writing an e-book was how to turn my written masterpiece into a polished and professional looking product that people would want to buy. I purchased a couple of different e-books on the subject; one even included multiple e-book templates to make the formatting process easier. But after trying to use the templates and getting frustrated, because they wouldn’t let me make the changes I needed, I started to look for someone to format my e-book for me. While I found numerous reputable professionals to format my e-book – the prices that they charged were hefty ($500 – $1,500 + additional fees for the number of words), and these prices didn’t even include editing costs. So I decided I was going to have to learn the process myself. Let me tell you; I’m so glad I did because it was super easy and I saved a ton of money! Not sure what to do after you finish writing your e-book? Here are the exact steps I took to complete the process. The first step that I tackled was the editing process. I went through the Word Document 2 -3 times and made many of the edits myself. I then hired a professional editor who went over the document with a fine-toothed comb (editing cost $200). I highly recommend hiring an editor – because they will catch little things like odd phrases, correct grammar, and punctuation usage. My editor even checked all of my links in the document to make sure that they were working. Once the editing process was completed, it was time to format my document into an e-book. Your e-book should be broken down into chapters or sections. At the end of each chapter or section, you will need to add a section break. In Word simply Insert > Page Break. After you have added all of your chapter breaks, you will need to structure your document’s style. This step is crucial because every time you decide to modify the look of an element; say for instance you want to modify each chapter with a larger font, it will be automatically be updated in all elements just by modifying the one element. Once you’d added the styles into your document, choose the font type, size, and colors that you want to incorporate for each element (title, subheadings body, etc. ). The standard font for most e-books on the market today is 12 – 14. Page Numbers and Table of Contents. Nex, you’ll want to add your page numbers, headers, and footers. Just go to Insert > Header, Insert > Footer or Insert Page Number. Here you can add a variety of custom options, from including the title of your book, date, page number and company name. Play around with it to see what looks most visually appealing. Once you’ve finished adding your header and footer you can add your table of contents. Simply go to References > Table of Contents. For your table of contents to format correctly, you must have style elements in place for your chapter titles and article titles. The table of contents will be automatically generated for you. Word even makes it easy for you to make your own professional looking e-book cover. Simply go to Insert >, Cover Page. Here you will be able to pick from approximately 15 different templates that are easy to use and modify. For my e-book cover, I purchased a stock photo from StockFresh.com for a couple of dollars. Photos.com also has great looking affordable stock photos. Once you’re happy with the finished product, use Word and save as a PDF. Don’t have a shopping cart on your website? No problem. Set up an account with e-junkie, here you can upload your e-book and process payments to your PayPal account automatically. Once you’ve set up your E-junkie account, create your sales page and include your E-junkie links. You can even set up an affiliate program through e-junkie, and it only cost $5.00 a month. Next, you’ll want to create an image to promote your e-book. I used My Ecover Maker.com. Here you can upload an image of your book cover and transform it into a 3D image for just $3.95 (one time use). If you want to spruce up your sales page, try taking a look at Leadpages – I haven’t used it personally, but it looks like it can give you some good options for $25 a month. If you look online, you’ll see tons of e-books being sold, and the majority of these sellers aren’t charging sales tax. While tax law is very tricky, and it’s wording many times unclear, Nexus Laws in your state may require you to charge state sales tax on digital products that you sell. Not being in compliance with your state’s Nexus Laws could put you at risk for hefty fines and back payment of taxes on products that you have already sold. So before you start selling your e-book, check here to see if your state requires you to charge sales tax. I’ve gone through the process here in Texas, and it was relatively painless. You may have the best e-book on the market, but without good sales copy, you won’t convert lookers into buyers. There are many tricks for writing compelling copy, such as creating catchy headlines, using bullet points, outlining the value of the product and having a strong call to action. But before you slap something onto your sales page, take some time to learn about good copywriting techniques, Copyblogger and AWAI have great articles on how to write good copy. If writing isn’t your strong suit, consider hiring a copywriter; what you spend on the front end, you should easily recoup on the back end. I’ll be honest with you, when I first started selling my e-book, I assumed it would be an easy, passive income stream – I’d write my e-book, create my sale page and the sales would just start rolling in. While I did generate a lot of sales, to begin with (solely because I was promoting my new e-book all over the place) the sales quickly tapered off and became a slow trickle. From everything that I had read online, having an affiliate program was a must if you plan on making a decent amount of money from your e-book. So I launched my affiliate program, promoted it to my readers and generated some more sales, but these revenue streams quickly dried up too. The point of the story is to keep your sources of revenue flowing; you constantly need to be promoting your e-book and affiliate program in creative ways. Have you created an e-book? Are you stuck on what to do next? Drop us a note we'd love to hear from you! Thanks for letting me know there was a broken link — it’s fixed! Thanks for this article. I finished my book 4 months ago and have just finished editing it (following feedback from a professional editor). I was quite surprised to read that you paid $200 for a professional editor and i was wondering if you could share the contact details of the editor you used. Thank you so much for this post. I just finished a nine week course on writing my first book. I went through all the trainings of key word searches, polls, etc. and then started writing. But as I do, many questions arose in my mind. What you wrote and the links you gave are a gift to me. I cannot thank you enough. You’re welcome Donna! Keep me posted on your progress. One day I will do this :) The idea is sort of intimidating and many of the things that were of concern to me you addressed in this post. Just a little over $200 does not sound bad to me at all, and the fact you’ve made that back already plus more is wonderful. I highly recommend doing it – not only is a great to have an actual product, but it was a terrific learning experience. I’ve created several e-books using the process you mentioned above (I’ve even created a couple of ebooks for other people who gasped at the high fees of design agencies – over $1000 in their case!) It’s a great way to dip your toe in the world of info products without spending a lot of money or needing technical skills. I’ve also written/published a Kindle book and there are pros and cons to each option. As with anything in internet business, I think you need to decide on your goals and then decide which option (PDF/Kindle) is going to take you there. Yes, you just need to decide on what your goals are for writing the e-book. If it’s greater exposure, Amazon is probably the way to go. If it’s to create more revenue, I said sell it yourself. Thanks for stopping by. 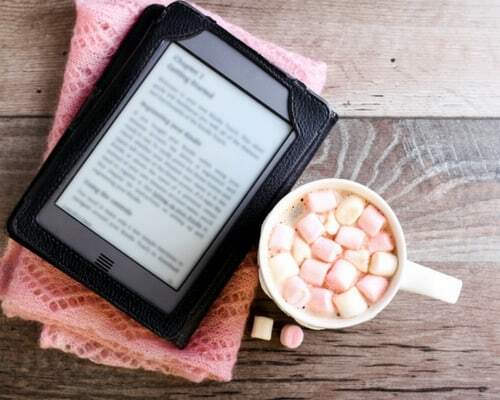 Why did you decide not to publish your e-book through Kindle on Amazone? I’ve written my book, and looking into the best ways to sell it. Amazon seems like a simple way to go about it – and capture tons of traffic – but, I’m not sure. Any thoughts on that? Honestly, I hadn’t considered it. But it seems like I would have to significantly decrease the price of my e-book and I’d be paying Amazon 30% of sales. Definitely something to look into though. Thanks for the insightful post. I hope you will do a follow up on “How to market your ebook”. We would love to read about that process too. Hi Bola – I’ll do that – great topic idea! This is very helpful! I would love to write an e-book someday. Thanks for sharing some of the process and costs. Yes, with BlueHost you pay for the year. To start your e-book, brainstorm ideas, come up with an outline, then create a writing timetable. Then start writing. Total cost to produce was $216. I’ve already made all that back and a nice profit. Of course the e-junkie fee is a monthly recurring fee, but it’s just $5.00 a month. that’s wonderful, Holly! for anyone that may have been thinking about getting theirs done, you’ve certainly shared enough to get em going in the right direction. nine months isn’t a long time and i’m not surprised at all most of it was spent on fine-tuning rather than writing the actual ebook. so in total, how much did it cost to produce it and how many books do you need to sell before you start profiting? !